Verification is a quality-control method that the U.S. Department of Education uses to check the accuracy of information submitted on the Free Application for Federal Student Aid (FAFSA). All schools that disburse Federal Title IV Funds are required to participate in the verification process. The verification process is a manual review and requires a minimum of 2-4 weeks for processing. The Blinn Office of Financial Aid will notify you by email if you are required to turn in documentation for the verification process. The documentation required will post in your myBlinn portal, under the Financial Aid checklist. Failure to submit the appropriate information will prevent awarding or result in the cancellation of existing financial aid awards. If there are any discrepancies found between the information reported and the actual information submitted, corrections will be made to your FAFSA and adjustments may be made to your financial aid package. Students are selected for verification by the U.S. Department of Education or by the school if there is a reason to believe that there are conflicts of information. Students who are selected for verification are not being punished; rather, students are extensively reviewed to ensure that they are awarded the aid for which they qualify. 1.Signed Verification Worksheet for Dependent Students. Request a complete tax transcript online at www.irs.gov/individuals/get-transcript. Request a wage and income transcript at www.irs.gov/individuals/get-transcript. Please go to www.irs.gov/pub/irs-pdf/f4506t.pdf and submit to the IRS. Please note that if there are any discrepancies with the documentation submitted, you will receive an email through your secure Blinn email account. 1.Signed Verification Worksheet for Independent Students. All Please note that if there are any discrepancies with the documentation submitted, you will receive an email through your secure Blinn email account. Write your Blinn ID on each page submitted via fax, email, in-person, or by mail. If selected for verification, do not leave the answer to any question blank on the verification worksheet. Indicate a zero or N/A if applicable. 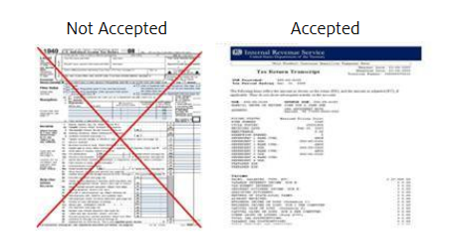 If a tax transcript is requested on your checklist, do not submit a tax return form. An official IRS Transcript is required. Use the IRS Get-Transcript online feature.